Garda Smith had been a month off work, primarily due to the embarrassment the incident had caused. 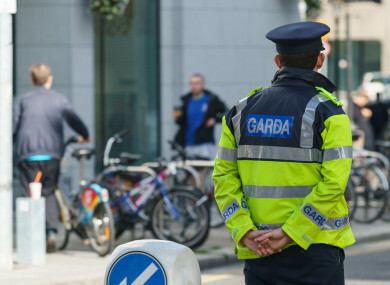 A GARDA, WHO went to the assistance of colleagues restraining a man outside a Co Donegal nightclub, found that the belligerent was a brother of his girlfriend, a High Court judge has heard. Garda Fintan Smith told Mr Justice Michael Twomey in a garda compensation hearing that when his girlfriend’s brother saw him he headbutted him, causing him a nose bleed and leaving him with a black eye. Garda Smith said he had fallen to the ground while his assailant was put in handcuffs and taken to a garda car for transfer to Letterkenny Garda Station. He was sitting in the front passenger seat of the garda car and was kicked to the side of the head by the man. He told his counsel Fiona Crawford that he had earlier been driving the garda car on patrol on St Patrick’s night 2012 when he saw the disturbance outside the Letterkenny night club and stopped to help. Smith, now aged 32, told Crawford he and his girlfriend had since married and although his girlfriend’s brother had been invited to the wedding in May of this year he had not turned up. Garda Smith said he had afterwards not maintained any relationship with his now brother-in-law but had very good relations with his other in-laws. If he could avoid it, he would still not attend any family get-togethers if he knew his brother-in-law was going to be there. Crawford, who appeared with Gallagher Brennan Solicitors, Letterkenny, said he had sustained an injured nose but x-rays had revealed no bone injury. His black eye had cleared up after a short time and had simply been an embarrassment to him. Smith said the incident had caused a lot of stress between himself and his partner as he did not want to meet her brother afterwards. He had been uncomfortable with the situation and, after seeking a transfer from Letterkenny, was now stationed in Ballybofey. He had been angry about the effect the incident had on his home and working life. Garda Smith told barrister Tom O’Connor, counsel for the State, that his now brother-in-law had been in trouble with the gardaí at the time. He would not be the sort of person who would have respect for the gardaí. Awarding Garda Smith damages of €4,000 for the injuries to his face and head, Judge Twomey said his now brother-in-law had a negative attitude towards gardaí. He said the award was for a black eye and sore nose and for psychological injuries that had resulted from the incident. Email “Garda awarded €4k compensation after girlfriend's brother headbutted him outside nightclub”. Feedback on “Garda awarded €4k compensation after girlfriend's brother headbutted him outside nightclub”.